After finishing his special treat each morning, Dan heads off toward the front field in search of the flock. There is something about watching him quietly moseying down the road at his unhurried donkey pace, tail swishing back and forth, that I always find so endearing. This is one of my favorite moments of the day. what a frickin sweet picture. i'm almost there. Awww. His back end is as cute as the front! I wish I had a donkey. And/or a tail. "...she really takes great care of me...gotta love mama...now let me see what those other jokers are up to this morning"
hey farmgirl- wanted to stop by and tell you i made your mexican monkey cake (again) last night and it is just soooooo delish. thanks again for that recipe. I made it for a cousin who said, "this is the BEST cake I've ever had". A pretty nice compliment. I'm posting the recipe tomorrow, if you don't mind, on my blog. What a cutie. I went out to my friend's farm today and fed him some apples. He is so sleek with his summer coat. Pretty soon he will be all bushy again. Oh bless him. He is having a think about the day. I wish my commute to work was as scenic as Dan’s! That's just a really cool pic of a really cool creature! Which side is his good side? Never mind. 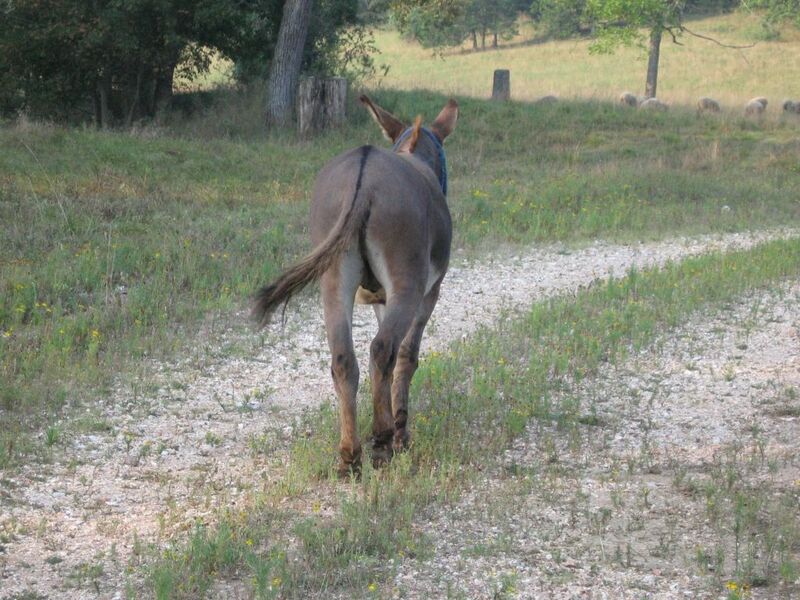 I've always thought donkeys were so adorable, I love your photo! I having serious donkey envy. Just found your site today by clicking on a link on someone else's site! I am sitting here awestruck by the beauty of your photography. Your bio has ignited in me a longing to go find an old farm and leave city life behind. It's rare to find a website that moves people. You put us all to shame. Congratulations on your site and for having the guts to follow your dream. Jeff beat us again. We join in his compliments. Make this a poster, print up some extra tails, add a few push pins, and you've got a classic birthday party game. Dan is destined to be famous. Hey, no fair pinning the tail on the chickenz....ow.